To increase the on-time high school graduation rate to 90 percent by the Class of 2020 and put millions more young people on the path to adult success. The GradNation campaign brings focus and energy, research and best practices, national attention and a broad coalition to the graduation challenge. For those working to increase high school graduation rates, GradNation provides data, insight and analysis; information about effective and promising practicies; plus opportunities to connect and learn from one another. Four organizations – America’s Promise Alliance, the Alliance for Excellent Education, Civic Enterprises and the Everyone Graduates Center at Johns Hopkins University School of Education – lead the campaign, and hundreds more play critical roles nationally, in states and in communities. Follow this link to visit the GradNation website. 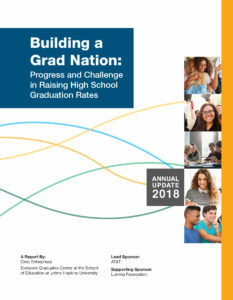 The 2018 Building a Grad Nation report takes an in-depth look at the progress that was made between 2011 and 2016 in raising high school graduation rates and the state and district sources of those improvements, and identify where challenges remain. The report links improvements in high school graduation rates to the need to ensure that all students, including those historically underserved by the education system, graduate high school prepared for postsecondary education. This report comes at a turning point for the nation, as the Every Student Succeeds Act (ESSA) becomes a reality and the power of accountability moves from the federal government into the hands of the states. It also comes amid growing calls to revamp high school education to better equip students with the academic, social, and emotional skills they need to succeed in postsecondary education and careers, and within a larger conversation on long-standing inequities for young people of color, those growing up in poverty, and children with disabilities. This year’s report includes a baseline by which states efforts under ESSA can be examined. The report shows for each state which districts have been driving progress, which subgroups of students are over-represented in each state’s four-year non-graduates, and in which types of schools — traditional, alternative, or virtual — students who do not graduate can be found. The report also addresses the concerns about gains in some places by facing them head on and identifying a series of questions that need to be answered to ensure the continued integrity of high school graduation rates. Lastly, this year’s report concludes with a set of policy and practice recommendations that aim to help the nation reach its goal of a 90 percent high school graduation rate for all students. For additional materials, please visit the 2018 Building a Grad Nation report website. Reports are updated annually. Choose any of the previous reports below to learn more about Building a Grad Nation.